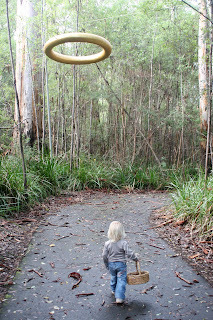 We stopped for a walk in the Karri forest on our way home yesterday. A gentle stroll through some old growth forest that became home to an art installation after it was saved from the sawmills. 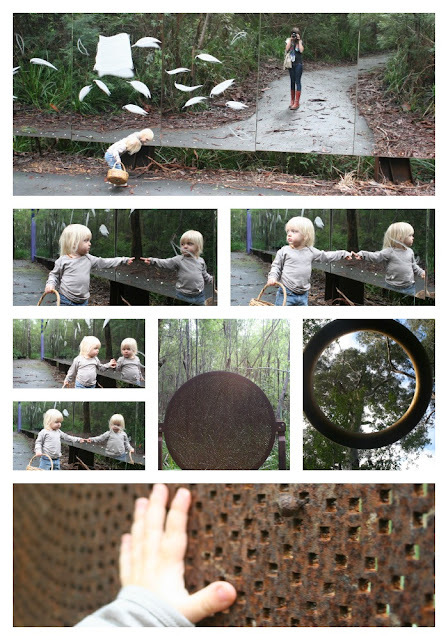 Swarbrick is a wonderful intersection of art and nature and a very hands-on experience for even the very young. Giant mirrors reflect the forest as you approach, and Quinn was desperate to find out what was behind the wall of perception. 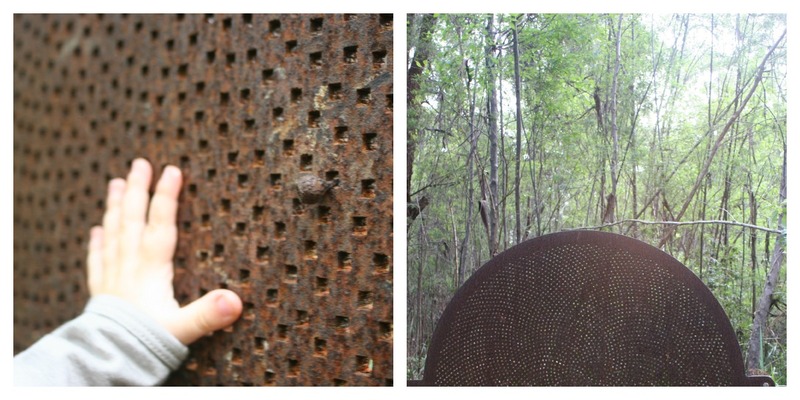 A rusted disc dotted with a mandala of holes had him breaking a small gum nut from its branch and gesturing for me to lift him up, so that he could post it through a hole. He carried his basket with him and gathered nuts from the branches that had broken and fallen to the ground in last week's storms. A giant casuarina tree had crashed across the path and we found a birds nest still resting in its canopy as we climbed over its mossy trunk. We are surrounded by nature here but, especially once the winter sets in, it is easy to hibernate inside while the forest drips around us. For one day at least we stepped outside our day to day routine. New words tumbled from my two-year-old's mouth as we took the time to look and listen beneath the trees. His favourite installation, and the one he spent most time wondering at, was one mother nature made herself. He spotted the twisted tree as we headed back to the carpark and stood gazing at it for the longest time. 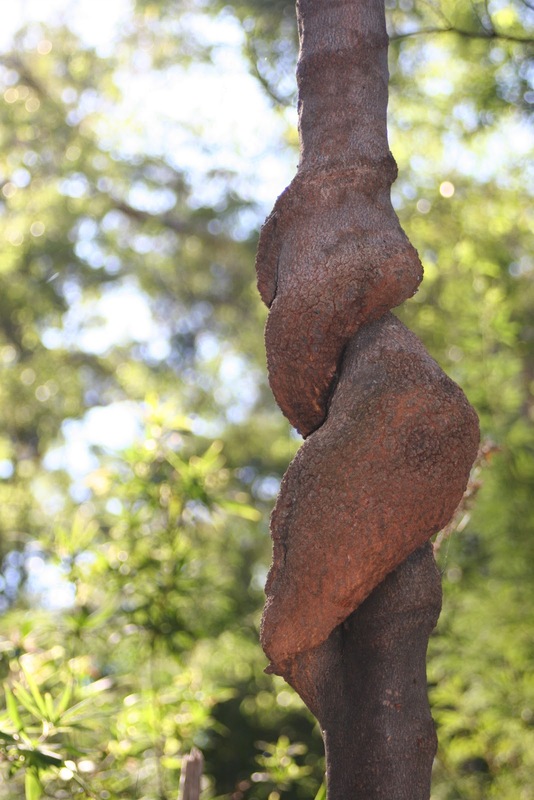 "Twisted tree," he repeated over and over. I do love art that interacts with its environment, that draws you in and makes you see things anew. The twisted tree felt like the forest's parting gift to us. Not that any scales need to be lifted from this child's eyes. He sees things so completely differently to me and always wants to share his discoveries, from the tiniest frog to the tallest tree. Friends took me throug the Karri forest on the way to Albany earlier this year..I was totally captivated by it's beauty and massiveness. It actually reminded by a lot of New Zealand. How beautiful! I'll have to put it on my must see list. Hi Alison, this looks like a lovely spot to visit, how lovely that you live so close. I love when art and nature become interactive. What an amazing place. We will definitely head over next time we are down that way. It looks magical. I love how those sculptures and trees complement each other. Brilliance! !